Through the program, high-performing seniors apply to secure their spot in the Ole Miss Pharm.D. program. If accepted, they do not have to go through the competitive application process that normally occurs during a pre-pharmacy major’s junior year. “I enjoyed living in the LLC because I was surrounded by like-minded, driven people who had the same classes as me,” said Lauren Pitts, a second-year Early Entry student from Hattiesburg. “It was nice being able to walk a couple doors down and work on homework or study for a test with people in my same major. The incoming class of LLC residents will live in Burns Hall. Besides allowing students to get to know one other better, the LLC offers social activities, free tutoring and study resources. Lindsey Cooper, admissions counselor for the School of Pharmacy, attributes the program’s success to the close bonds Early Entry students form during their first year on campus. “The EE1s truly become like family to one another, not only because many of them live in the same residence hall, but also thanks to a variety of program initiatives such as EE1-only classes in the fall and a strong mentoring program led by older students,” Cooper said. Now that this year’s 80 EE1s are nearing the end of their freshman year, they will soon become ambassadors and mentors for the next class of Early Entry students. 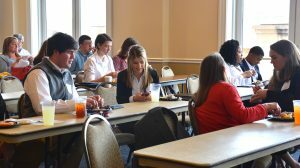 High school students interested in the Early Entry program can visit http://pharmacy.olemiss.edu/earlyentry or contact admissions counselor Lindsey Cooper at lindsey@olemiss.edu.